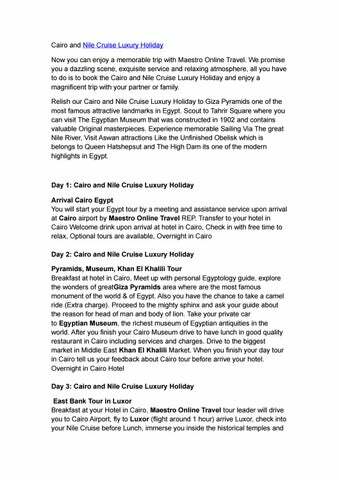 Cairo and Nile Cruise Luxury Holiday Now you can enjoy a memorable trip with Maestro Online Travel. We promise you a dazzling scene, exquisite service and relaxing atmosphere, all you have to do is to book the Cairo and Nile Cruise Luxury Holiday and enjoy a magnificent trip with your partner or family. Relish our Cairo and Nile Cruise Luxury Holiday to Giza Pyramids one of the most famous attractive landmarks in Egypt. 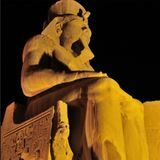 Scout to Tahrir Square where you can visit The Egyptian Museum that was constructed in 1902 and contains valuable Original masterpieces. Experience memorable Sailing Via The great Nile River, Visit Aswan attractions Like the Unfinished Obelisk which is belongs to Queen Hatshepsut and The High Dam its one of the modern highlights in Egypt.